Everyone needs to keep their clothes clean, but not realizing what ingredients are in detergents can be a huge red flag. Knowing what non-toxic ingredients go into your detergent can help you have peace of mind, which is why you can make your own homemade natural laundry detergent. We’ve researched and compiled recipes for multiple natural cleaning products. Each natural home cleaner recipe uses ingredients that are affordable, pure, and won’t irritate your skin or damage your clothes. They’re free from sulfates, fragrances, and other irritating chemicals. What are the Side Effects of DIY Natural Laundry Detergent? How Long Do Natural Cleaners Last? Is Natural Laundry Detergent Effective? Can DIY Natural Laundry Detergent Remove Stains? Borax, also known as sodium tetraborate decahydrate, cleans laundry and turns hard water into soft water. Combine this with baking soda (sodium carbonate), washing soda, and Castile bar soap which contains olive oil, and you have foolproof homemade cleaners. Put the Castile bar soap into a food processor or blender and pulse until the soap turns into fine dust. Next, use gloves and cover your face with a dust mask while mixing all other ingredients besides the essential oil into the tub. Once all of the ingredients are in the container, seal it and shake vigorously until all ingredients are evenly combined. Stir in essential oil if you want your clothes to have a pleasant scent. Similar to the last recipe, this one uses the same ingredients except for hot water. Some washing HE machines require liquid detergents, which is why this recipe comes in handy. Borax, washing soda and baking soda all have antibacterial properties used in multiple cleaners. Grate the soap in a food processor until the soap resembles sand. Put on a mask and gloves, as the dust may travel in the air and upset your airways. Put the grated bar soap into a pot. Add water to cover the soap dust. Boil the water and stir it occasionally to help combine. Add the baking soda, washing soda, and Borax to the soap and stir until all ingredients are combined. Pour mixture into the bucket and fill the rest of the container with hot water. Let cool before adding essential oil. Bleach is typically used to keep your clothes clean and remove oil stain from fabric. However, keeping bleach in a home with children can be dangerous. Instead, use white vinegar as a substitute. It functions in the same way by disinfecting and whitening your clothes. Vinegar is also great as a glass cleaner. Grate the soap until it becomes a powder. Mix the other ingredients except for the essential oil and white vinegar. Place these ingredients with the Castile soap into a sealed container and shake until it’s thoroughly combined. Add a few drops of lavender or orange essential oil before mixing well, then add the white vinegar to the mix and slowly stir. Store in an airtight container and use 2-3 tablespoons for each load. Fels-Naptha contains stain fighting properties that can be added to your laundry to treat oil, grease, and tough stains. Pair this with the beautiful scent of tea tree oil, and you have yourself an effective and soothing natural laundry soap for washing jeans and heavy laundry. It can also be used to clean stainless steel or as an all-purpose cleaner. Pulse the bars of soap in a food processor until smooth. Next, mix in the soap flakes, super washing soda, and Borax. Add the rest of the ingredients in the processor and mix. Add the tea tree oil and mix well to incorporate the scent. From there, transfer all the soap into an airtight container such as a Mason jar. When it’s time to use this mixture, place one tablespoon into your machine. Sodium Hydroxide, known as “lye,” is a chemical component in that works well as a natural laundry soap. Add coconut oil for moisture and anti-bacterial properties, and the cleanser is ready to go. Use it for multi-surface cleaning in your home. Mix the sodium hydroxide with cold water. Put the coconut oil into a microwave safe bowl and heat until the oil has turned into a liquid. Pour this mixture into the cold water and sodium hydroxide mixture and combine. Place the mix into a soap bar mold. Use a hammer to gently hit the bottom of the mold to help get the soap out before cutting it into rectangles. The three core ingredients in this recipe are washing soda, Borax, and baking soda. Add these to the dirt and grime fighting Fels-Naptha bars and brightening Oxy-clean for enhanced stain remover power to get an effective all natural laundry detergent. Grate the Fels-Naptha bar and add to washing soda and Borax. Put on some protective gear, such as gloves and a face mask, and pour in the baking soda. Mix the ingredients well before adding Fels-Naptha and Oxyclean. Once everything is well combined, you can add lavender essential oil. The combined forces of Borax and washing soda help to disinfect and prevent germs from lingering on your fabric. However, by adding Dawn dish soap and water, the mixture becomes a liquid detergent perfect for most washing machines. The versatility of the mix also enables you to use it to clean cutting boards, wood furniture, and for daily house cleaning. Put Borax and washing soda in a bowl. Mix the two until thoroughly combined before using a funnel to put them into an empty milk carton or another container. Pour the Dawn dish soap into the carton. Boil the water and add to the container. Slowly swish the ingredients until it turns into a liquid solution. All ingredients in this mixture are easy to find and cheap enough to last you multiple laundry loads. Zote, baking soda, washing soda, and Borax all have strong cleaning properties. To make your detergent, grate the Zote into small pieces. Add baking and washing soda. Pour in the Borax and mix. Stir the ingredients and store in an airtight container. Not all washing machines work well with dry ingredient detergents. An alternative is to create a DIY natural laundry detergent in liquid form from the same base ingredients. The only difference is that you’ll be adding good old H2O to the mix. It doesn’t contain harsh chemicals and can also be used to eliminate soap scum and as a toilet bowl cleaner. Empty a gallon milk container or a large squeeze bottle. Mix soap flakes, baking soda, and Borax in a bowl. Heat the water in a pot. Once the pan is boiling, slowly begin to stir the soap mixture into the water, making sure that all the small particles melt. Wait for the liquid detergent to cool before transferring it into a container. It’s possible to make your laundry pods by using a few key ingredients. Using concentrated amounts of Epsom salt, hydrogen peroxide, and vinegar you can successfully make useful pods. To create laundry detergent pods, mix washing soda and soap flakes in a bowl. Add Epsom salt and hydrogen peroxide. Mix all these ingredients and then pour in ½ cup of distilled white vinegar. After everything is combined, spoon the mixture into an ice cube tray or baking sheet with sectionals. We find that rubber ice trays work best at keeping their shape because the pods are easier to get out than from plastic cube trays. Wait for the mixture to set into the molds, which may take up to a day. Remove and use! Wool is a costly fabric that needs special detergent chemicals. By using denatured alcohol and soap flakes, the wool won’t get damaged and retain its smooth condition while being eco-friendly at the same time. Heat a large pan with water in it. As the water heats, put the soap flakes in a big mixing bowl. Add denatured alcohol and eucalyptus oil and mix well. Put these ingredients into the boiling water and whisk until dissolved. It should take a day to set before it turns into a jelly-like solution. No matter whether you’re using a top loader or a front loading HE machine, you’re going to need a compatible formula. Coconut oil is much gentler on the unit, along with the oxygen booster. Grate the soap with a food processor and pour into a bowl. Add washing soda and Borax. Mix in the oxygen booster and essential oil or lemon juice to provide clothes with a fresh fragrance. Baby clothes need softer detergents that have less irritating ingredients. Using washing soda ensures that the clothes get disinfected, while Castile soap is gentle on the fabric and has the least skin irritants. Grate the Castile soap into small particles and add washing soda. Place into an airtight container. It’s that simple! Soap tabs make it easy to pop one in and be ready to go without the hassle of measuring. Making your natural home cleaners into tablets can save you money and are just as effective as store bought versions. Grate the Castile soap bar in a food processor until it resembles a fine powder. Mix in the washing soda and Epsom salt. Pour in the vinegar while mixing. Blend in essential oil to help create a pleasant scent. You can skip this step, but we like to use lemon, orange, or lavender. Once everything is combined, spoon the mixture into rubber ice cube molds. Let them harden, which takes up to 24 hours. After that pop them in an airtight container. Store bought laundry detergent contains sulfates, chemicals, and filler ingredients that can be damaging to your skin and clothes. Homemade detergents only carry a few washing ingredients such as soap, Borax, washing soda, and baking soda. These ingredients can be found in any supermarket and don’t contain any extra ingredients that can cause skin irritation. By using pure ingredients such as Borax, bar soap, and washing soda, you’ll be creating a foolproof base detergent. Borax is a powerful stain cleaner that can be used to keep your clothes looking crisp and new. Washing soda and baking soda contain antibacterial properties that disinfect clothes and destroy germs. 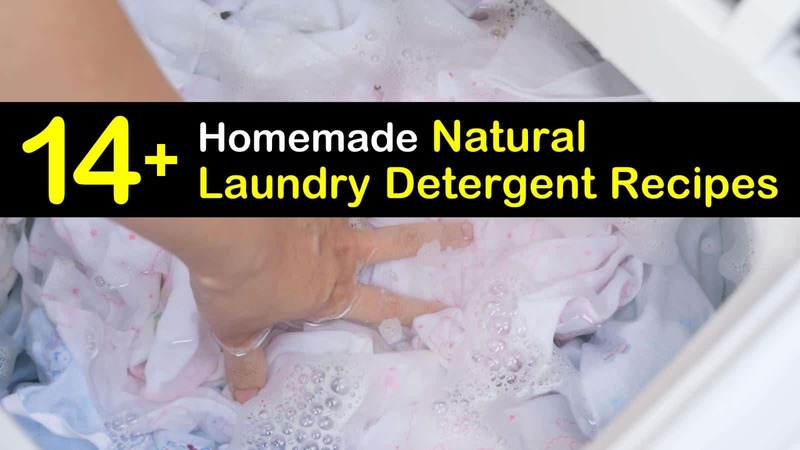 The base of homemade natural laundry detergent is relatively similar in all recipes. You will need Borax, Castile soap or soap flakes, washing soda, and baking soda. From there, add in water, essential oil, or other ingredients to make the homemade detergent. Favorite add-ins are bleach, vinegar, or fabric softeners. The amount of detergent you need depends on the recipe you use. Most of the time you’ll need around a tablespoon or two. Place the powder or homemade liquid detergent in your front loader machine like you usually would and use the correct settings for a load of laundry you’re washing. Other alternatives include pouring it down the garbage disposal, using it as a floor cleaner, or as hand soap. Any recipe using vinegar also naturally makes a good window cleaner. The side effects also depend on what ingredients you use to make your laundry soap. If you’re following one of the above-listed recipes, then you may experience skin rashes, itchy skin, and irritation of the eyes and nose. This can be due to allergic reactions or sensitivity to one of the ingredients. Some people also react to essential oils, so be sure to do a spot test on your arm before placing drops into your detergent. Homemade laundry soap lasts a few months if it’s made into a powder and doesn’t contain any extra ingredients. However, liquid soap only lasts a few weeks. To extend the lifespan of your product always store it in an airtight container that is kept in a cool and dry place. Green cleaners are just as effective as the kinds you’d find in the supermarket. You can always customize your homemade laundry detergent to with other ingredients to suit your needs. If you’re washing whites, consider adding white vinegar. However, if you’re washing cloth diapers, you may want to leave extra ingredients and fragrances out as they can sometimes be irritating to younger children or babies. Although, if you need to unshrink jeans or other clothing items you can refer to one of our other articles. Yes! Our laundry soap recipe can remove stains with high efficiency by adding white vinegar or bleach. You can use vinegar in laundry while you’re making your detergent, or you can add it into your laundry load. There are plenty of methods to cleaning your laundry, but at least you know that your homemade detergent doesn’t contain any harmful chemicals. If you or your family members suffer from rashes, skin irritations, or itchiness from grocery store bought cleanser, making your laundry detergent could give them a better life. 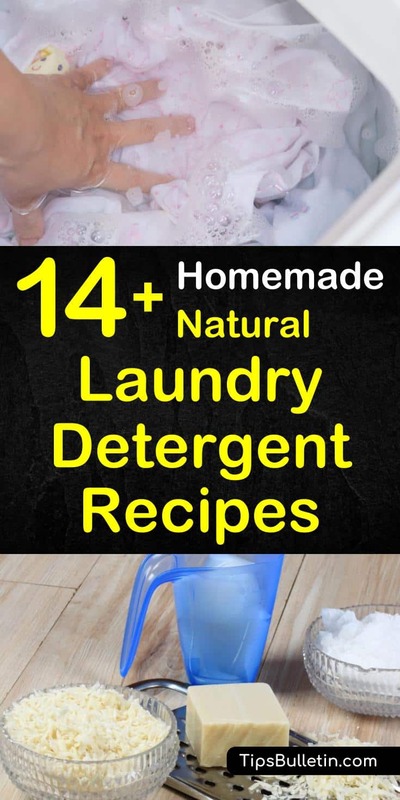 Hopefully, you like our homemade natural laundry detergent recipes. If you’ve enjoyed reading these laundry detergent making tips, please share these recipes with your friends on Facebook or Pinterest.